به‌منظور بررسی بهترین اثر تاریخ، عمق و فاصله کاشت بر خصوصیات رشد و عملکرد زعفران (.Crocus sativus L) در لنگرود گیلان، آزمایشی به‌صورت فاکتوریل در قالب طرح بلوک‌های کامل تصادفی با سه تکرار در شهرستان لنگرود در سال زراعی 1391-1390 اجرا گردید. فاکتورهای آزمایش شامل تاریخ کاشت (A) در سه سطح (25 تیرa1:، 25 مردادa2: و 25 شهریورa3: )، عمق کاشت (B) در دو سطح (سانتی‌متر 5b1: و سانتی‌متر 10b2:) و فاصله بوته روی ردیف (C) در دو سطح (سانتی‌متر 5c1: و سانتی‌متر 10c2:) در نظر گرفته شد. صفات اندازه‌گیری شده شامل عملکرد کلاله خشک، وزن تر گلبرگ، وزن خشک برگ، طول کلاله‌ها، طول گل، تعداد گل در مترمربع و تعداد روز از کاشت تا گلدهی زعفران بود. نتایج نشان داد، اثر فاکتورهای تاریخ کاشت، عمق و فاصله کاشت بر وزن خامه و کلاله، وزن ترگل، تعداد گل در مترمربع و تعداد روز از کاشت تا گلدهی در سطح احتمال 1درصد معنی‌دار است. اثر فاکتور B (عمق کاشت) بر وزن کلاله و خامه معنی‌دار نشد. همچنین اثر متقابل A×B بر وزن خشک برگ، وزن کلاله و خامه و تعداد روز از کاشت تا گلدهی در سطح احتمال 5 درصد معنی‌دار شد. اثر متقابل ACبر وزن کلاله و خامه و تعداد گل در مترمربع معنی‌دار بود. اثر متقابل BCتنها بر صفت وزن خشک برگ معنی‌دار شد تاریخ کاشت شهریور و فاصله کاشت 5 سانتی‌متر (a3c1) بیشترین عملکرد کلاله و خامه ( 9/4 کیلوگرم در هکتار) و تعداد گل را (67/64) به همراه داشت. تراکم 5 × 25 سانتی‌متر بالاترین عملکرد را بر صفت وزن کلاله و خامه و وزن خشک برگ را نشان داد و تاریخ کاشت تیر و فاصله کاشت 10 سانتی‌متر (a1c2) کمترین عملکرد کلاله و خامه (3/1کیلوگرم در هکتار) و تعداد گل را (83/19) به همراه داشت. بیشترین وزن خشک برگ از اثر متقابل (b1c1) عمق کاشت 5 سانتی‌متر و فاصله کاشت 5 سانتی‌متر و (a1c1) تاریخ کاشت تیر و فاصله کاشت 5 سانتی‌متر به دست آمد و کمترین وزن خشک برگ از اثر متقابل b1c2)) عمق کاشت 5 سانتی‌متر و فاصله بوته 10 سانتی‌متر و (a1c2) تاریخ کاشت تیر و فاصله کاشت 10 سانتی‌متر به دست آمد. پیشنهاد می‌شود در شرایط اقلیمی و خاکی منطقه گیلان، برای به دست آوردن بالاترین عملکرد و دوره بهره‌برداری زعفران در سال اول کشت، از بالاترین تراکم این پژوهش (80 بنه در مترمربع) در عمق 5 سانتی‌متر در کشت شهریورماه و عمق 10 سانتی‌متر در کشت مردادماه استفاده شود. 2M.Sc. Student of Agronomy, Department of Agronomy and Plant Breeding, Lahijan Branch, Islamic Azad University, Lahijan, Iran. In order to study the best time, depth, and corm sowing distance of saffron cultivation in Guilan Province, a factorial experiment was carried out based on a randomized complete block design with three replications in Langeroud, Guilan Province, during growing season of 2011-2012. Studies factors included sowing date (A) (a1: 18th July, a2: 18th August, and a3: 18th September), sowing depth (B) (b1:5 and b2: 10 cm), and distance between corms (C) (c1:5 and c2: 10 cm). Yield of dry stigma, wet weight of petal, dry weight of leaf, length of stigmas, total length, number of flowers and number of days from sowing to flowering of saffron were recorded. The results showed that sowing date had significant (at a significance level of 1%) impacts on the weight of style and stigma, wet weight of flower, number of flower, and number of days from sowing to flowering of saffron. Sowing depth had no significant effect on the weight of style and stigma of saffron. On the other hand, the interaction between sowing date and sowing depth was significant on dry weight of leaf, weight of style and stigma, and number of flower per square meter of saffron. The interaction between sowing depth and corm distance was significant on dry weight of leaf. The highest yield of style and stigma and number of flowers of saffron were recorded at sowing date of 18th September based on 5 cm corm distance, while the lowest yield was for sowing date of 15th July and 10 cm corm distance. Density of 5 × 25 m2 produced the maximum yield of style weight, stigma weight, and dry weight of leaf. The highest leaf dry weight was observed in interaction of sowing depth and corm distance (sowing depth of 5 cm and corm distance of 5 cm) and interaction of sowing date and corm distance (sowing in July and corm distance of 5 cm). On the other hand, the lowest dry weight of leaf was produced in interaction of sowing depth and corm distance (sowing depth of 5 cm and corm distance of 10 cm) and interaction of sowing date and corm distance (sowing in July and corm distance of5 cm). Abrishami, M.H. 1997. Saffron of Iran. Toss publications, Tehran, Iran. 32 pp. (In Persian). Ait–Aubahou, A., and El- Otmani, M. 1999. Saffron cultivation in Morocco. Harwood Academic Publications, Amsterdam, the Netherlands. Alavi-Shahri, H., Mahajeri, M., and Falaki, M.A. 1994. Effect of plant density on saffron yield. 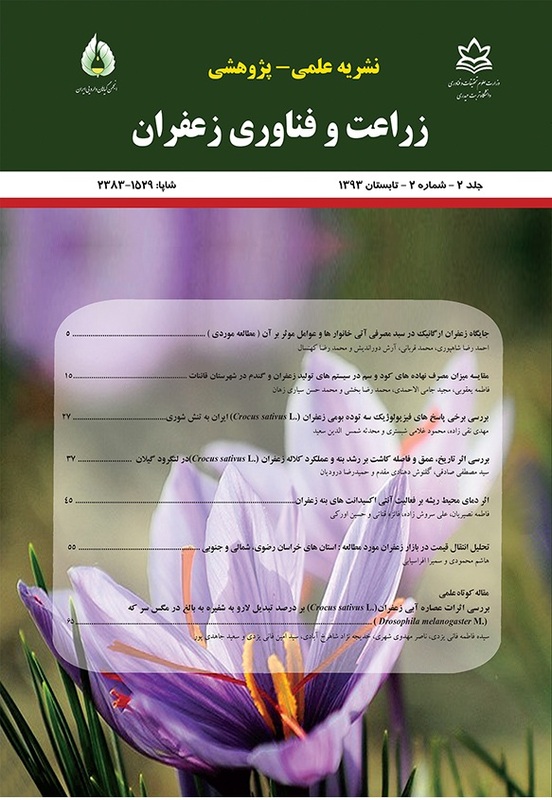 Proceedings of the second conference of saffron and medical plants cultivation Gonabad, Iran. (In Persian). Behnia, M.R. 1991. Saffron Cultivation, Tehran University Press, 285 pp. (In Persian). Coventry, D.R., Reeves, T.G., Brooke, H.D., and Caann, K. 1993. Influence of genotype sowing data and seeding rate on wheat development and yield. Australian Journal of Experimental Agriculture 33: 751 – 757. De-juan, J.A., Crcoles, H.L. Monoz, R.M., and Picornell, M.R. 2009. Yield and yield components of saffron under different cropping systems. Industrial Crops and Products 30: 212-219. Ghalavand, A., and Mazaheri, D. 2000. Effect of bulb weight on flowering and potential of saffron shrubs. Journal of Research and Development 4: 65 – 69. Ghalavand, A., and Abdollahian -Noghani, M. 2004. Study ecological adaption and effect of plant density and planting method on yield of native saffron bulks of Iran. Proceedings of the Second Conference of Saffron and Medical Plants Cultivation.Gonabad, Iran. (In Persian with English Summary). Gresta, F., Arola, G., Lombardo, G.M., Siracusa, L., and Ruberto, G. 2008. Saffron, and alternative crop for sustainable agricultural systems, A Review Agronomy Sustainable Development 28: 95-112. Hosseinzadeh, H., and Younesi, H. 2002. Petal and stigma extracts of Crocus sativus L. have Antinociceptive and anti – inflammatory effects in mice. BMC Pharmacology 2-7. Kafi, M., and Showket, T. 2006. A comparative study of saffron agronomy and production systems of Khorasan (Iran) and Kashmir (India). Proceeding of 2nd International Symposium on Saffron Biology and Technology Mashhad, Iran, 28-30 October. 123-132. Kianbakht, S. 2008. Systematic review on pharmacology of saffron and its effective ingredients, Journal of Medicinal Plants 7 (28): 1 – 27. Koocheki, A, Alizadeh, A., and Ganjali, A. 2011. The effect of increase temperature on flowering behaviour of saffron (Crocus sativus L.) Iranian Joural of Field Crops Science 8 (2): 324-330. (In Persian with English Summary). Koocheki, A., Tabrizi, L., Jahani, M., and Mohammad Abadi, A.A. 2011. Evaluation of high corm density and three methods planting on some agronomic traits of saffron (Crocus sativus L.) and corm situation. Horticulture Science 42 (4): 379-391. Mokhtarian, A., and Rahimi, H. 2006. Investigation on influence of depth planting and summer irrigation on saffron yield and population variation of Rhizoglyphus robini in Gonabad. Final report. 913/85. Khorasan Razavi. (In Persian with English Summary). Paseban, F. 2006. Effective factors on exporting Iranian saffron. The Economic Research 6 (2): 1–15. Pazoki, A., Kariminejad, M., and Fooladi, A.R. 2010 Effect of cultivation time on performance of ecotypes of saffron in Natanz. Journal of Medicinal Plant 2 (8): 3-12.